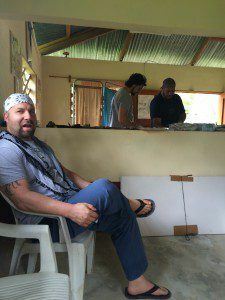 Clinic started early in the warm humidity of the Guatemalan jungle. The clinic was sparse, clean and perfect for our needs. While seeing patients, a young girl presented with a large tumor in her back. Since it was late in the day, I decidecd to operate on her in the morning when it was cooler. After clinic we hiked to the river and headed to the Finca Tantin. A cool place to hole up for the night. After we arrived the rain started again but the fire was warm.